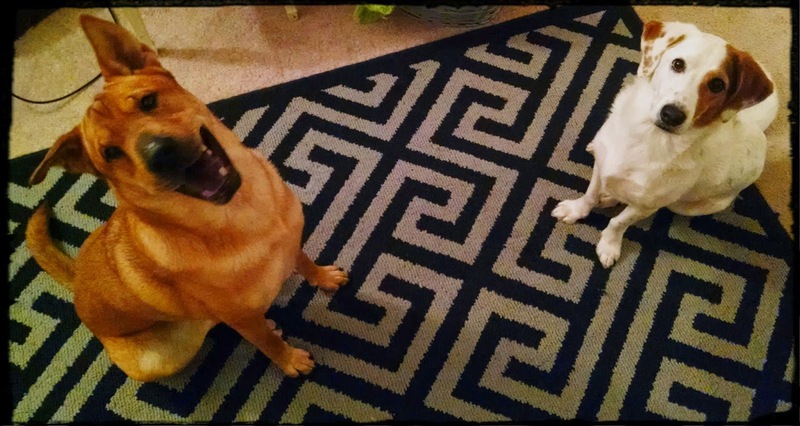 February 2015 – He Said What?! Aaron had two doctor appointments this week. On Tuesday we went in for his yearly eye exam, and on Thursday we went to the dentist to have his teeth cleaned. He very much prefers the eye exam. For one thing, nothing hampers him from talking to his heart’s content at the optometry clinic. No one has their hands in his mouth, doing uncomfortable procedures, and so he can talk and talk…..which he definitely did. He charged right up to the check-in counter at the eye clinic and didn’t even say hello before he started telling the two receptionists all about Fallen Skies and alien skitters and the skitter-in-charge, named Cochise. It’s just amazing how Aaron will launch right into his tall tales without one word of hello or a few words of explanation to get him started. Nope, he just barrels right in to his review of whatever is currently on his mind, oblivious to the confused looks of those to whom he is talking. Or he’ll mention his day group, Paradigm, or someone at Paradigm, as if these ladies know all about this place and those people……which they don’t, and so once again they are confused. This is why one of my job descriptions is that of interpreter. I definitely multi-task big time as I try to sign forms, go over insurance, check for information changes, and explain skitters. Thankfully these ladies were delighted with Aaron. Their give and take with him only encouraged him to continue with his stories, and I had to urge him to finally hush and follow me to a chair. His forced silence was short lived. He was immediately called back to begin the exam, so he hardly missed a beat before he was telling a new person about Falling Skies and skitters and that he broke his glasses the week before. He made me laugh as he did one of the eye tests, putting his hands up to the machine as if he was gazing at something exciting. Maybe he thought he would see another skitter? 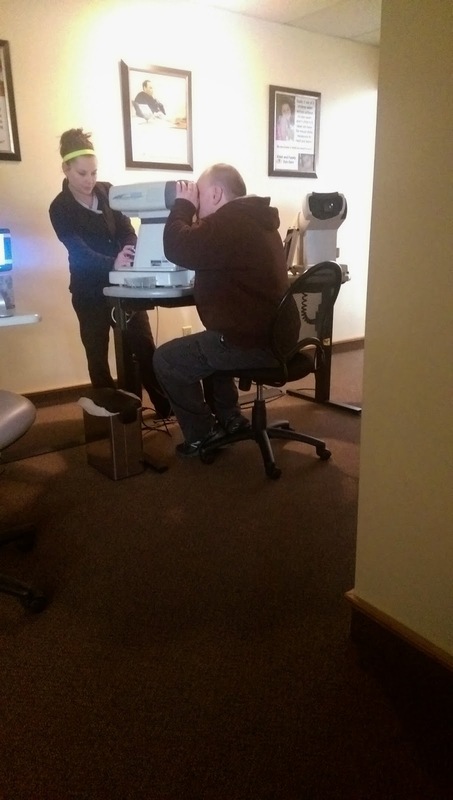 The eye exam went well with patient Dr. Fisher……our friend, Brandon. Of course, Aaron just had to tell him that he got in trouble for calling Stephanie a babe at Paradigm. And there I was, proud Mom, wondering if I should explain. Then it was on to get his new glasses. Trying on glasses is Aaron’s least favorite part of this process. It ranks right up there with trying on clothes. He just doesn’t want frames that make him look like Clark Kent. After that fact is established, he could care less. And going over insurance is really boring to him. Again, two understanding technicians and lots of laughs helped tremendously. Soon we were eating lunch at Chili’s and all was great in Aaron’s world. Thursday was teeth cleaning day. The dental exam is really, really Aaron’s least favorite thing in the world to do. Most of us don’t like teeth cleanings, and Aaron is no exception. It’s uncomfortable for Aaron, plus he can’t talk and so it’s a long process of frustrating scraping and rinsing and forced silence. I used to go back with him, but now I let him go alone. I urge him to be mature…..plus it’s best for me to have an element of ignorance about what really goes on back there, on Aaron’s part. I know he gets frustrated and impatient. Once he bit the hygienist. He said it was an accident. I wasn’t totally convinced. Another part of it is that Aaron doesn’t want us to talk about how he doesn’t do a good job with brushing his teeth. That’s why we have gone every four months for cleaning, and now have decided to go every two months. Aaron starts getting angry if I talk about his teeth at home, if I try to help him at home, or when the dentist or hygienist is talking to me about Aaron’s teeth. We try to keep it low key but with instruction for him, too, yet nothing really helps. Later, as he took full advantage of the Pizza Hut buffet, we mentioned his teeth just a little. 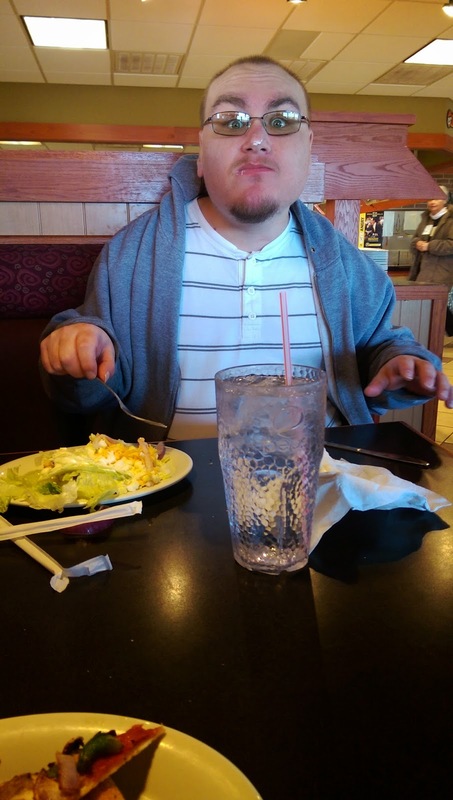 Most of the time we talked about whatever entered his mind as he thoroughly enjoyed the pizza and the salad. I laughed at the dressing on his nose and the look on his face, and I had to tell him many times to talk softer as he was talking in high gear once again, like he was making up for the lost moments when his mouth was silent at the dentist’s office. We went to Sam’s for a few things. On the way home we stopped at my elderly friend’s apartment. Aaron hadn’t seen Nora’s new place. I dropped off a sweater to her that I had repaired. She was delighted to see Aaron. Once again I was the interpreter as he told her about skitters and Paradigm this and that, and she stood there clueless. She gave him a piece of candy, and he thanked her. “Are you glad I said thank you?” he asked me as we left. “Are you glad I told her hi?” I told her that I was very thankful that he had practiced his manners. Manners were a little absent later that night, however. A lot absent, actually. Like a light switching off….or on…..Aaron’s mood changed dramatically. We haven’t seen that kind of change in a long time. He instantly went from happy to angry as he prepared to go to bed. He decided to focus on his teeth. He slammed our bedroom door, and he slammed his bedroom door. Then I heard him stomping up the hall, where he barged in our room yet again. “I’m not going back to them!” he angrily said….referring to the dentist. And he called me a name, several times. This was surprising because Aaron has been so mellow lately. I wondered if this foul mood was related to his new seizure drug, which can cause anger. Or was he going to have some seizures. Often, mood changes precede seizures. And sure enough, he had two hard seizures during the night, and another one yesterday morning as he lay on the couch. He chewed the end of his tongue again, and wet the bed. I wondered what he thought as he silently watched me yesterday morning in his bathroom, on my knees cleaning up the pee that was on the floor around the toilet. He was unsteady when he got up and he told me this had happened. I thought about his anger the night before, and the name he had called me. It would be easy sometimes to show anger right back to him, and I certainly have done that. But that night before I had remained mostly silent, knowing that it was futile to reason with Aaron when he was so angry. Now before our issue was resolved, I was on my knees cleaning up his mess…..because I love him. Just like God loves me, I thought. Here, once again, in my life with Aaron I have another example of God’s love for me, expressed unconditionally. God loves me when I’m happy…..He loves me when I’m angry……and he cleans up my messes and he soothes my heart over and over again. How can I do less with Aaron? I washed all of Aaron’s bedding during the day as he slept on the couch, and was reminded again of God’s love for me as I love Aaron. I’ll be doing this again, too, and so will God with me. Faithful love is what God shows to me, and is what I need for Aaron, as well…..even with the still fresh reminder of Aaron’s anger the night before. Last night, when Aaron could no longer keep his eyes open, I helped him get in bed. His covers were all clean and fresh. He was ready to get in bed when he remembered that he needed to fill out his notebook. He had written the time that he got up that morning, so now he wrote the time that he went to bed. It was 9:52. Then he asked me to put his snake and his skunk in the bed. I laid Mr. Snake under the covers and Aaron stood there staring at him. Then he told me to scoot him over a little, which I did. Aaron stared again. And I had to move Mr. Snake once more until he was finally in just the right place. Then the skunk went in the bed, just right, and finally Aaron got slowly under the covers. He gave a huge smile as he felt the weight and the warmth of the covers on his tired body. We hugged and Aaron smiled again. Then he laughed, and I asked him why. “I told Dad I’m glad you took care of me when I had a seizure,” he slowly said. All thoughts of anger and name calling vanished at that moment. I was thankful for the privilege I have to take care of Aaron, and I told him that. He smiled again as I pulled the covers up until just his smiling face was showing. I turned off his light, and I closed his door…..and I thought of what a difference a day can make. What a difference knowing God makes, too. I’m glad God takes care of me so that I can take care of Aaron. And I’m glad that He continues to use Aaron in my life to teach me so many things about Himself. I’m switching gears here and writing today, not about Aaron, but about Andrea. Hey, when you’re in this family, you’re fair game! HeHe. Actually, she gave me her permission, so all is well. I hope. Andrea has packed a lifetime of experiences into the less than a year that she has lived in Houston. We’ve gotten so we say, “If it can happen, it will happen to Andrea, in Houston.” I won’t even attempt to list all the events of her life that have occurred over the past 8+ months. No one would read a blog that long. But I do want to tell you about her latest…..at least her latest as of today, that I know of. It was this past weekend, on Sunday, that Andrea returned to her apartment after being out. She put her key in the lock only to find that her apartment door would not open. She soon realized the problem. It seemed that her dead bolt was locked, but it only locks and unlocks from the inside. Very strange. But her mind quickly remembered a friend whose dog had managed to somehow jump up and lock her dead bolt. Andrea was sure that one, or both, of her dogs had done just that while she was out. Darcy and Oakley, in fact, were in the apartment wondering why Andrea wasn’t coming inside. And Andrea was outside her locked door, realizing her situation, and grasping for straws. “Come on, Darcy,” she said. “Jump! Unlock the door.” Nothing. “Oakley!” she continued. “Come on! Jump! Unlock the door.” Still nothing but the sound of panting dogs, wondering why Andrea didn’t open the door as always and come inside. She realized how ridiculous she sounded, but it was about to get worse. She reached into her purse and pulled out her credit card, thinking that perhaps she could break into her own apartment. There she was, bent over a little and working hard to unlock her door……with a credit card…….when the apartment door across from her opened and out walked the occupants whom she had not yet met. They were somewhat shocked at what they saw, which was Andrea trying to open her door…..with a credit card. They looked at her with very suspicious eyes. She thinks they believed her as they asked if there was anything they could do, but there really wasn’t anything they could do unless they knew more about breaking and entering than she did. Apparently not, because they went on their way. Trusting souls. Their apartment could have been next. Her dogs locked her out? Really? Seeing that her breaking and entering skills were dismal, Andrea called the weekend apartment maintenance number. Of course, there was no answer, so she left a message…..and she waited…..and waited…..and waited. She called again, reminding the missing maintenance person that darkness would be coming before long. Then she called her friends, Joe and Eva, who are such sweet people. Joe and Eva drove right over to assess the situation, which was fairly simple. Jumping dogs had locked Andrea out of her apartment. That was pretty much it. Andrea’s apartment has a balcony and Andrea knew that she could get in the balcony door. But did I mention that her apartment is on the third floor? Yes, third floor. So, a ladder was needed. A tall ladder. Joe did not have a tall ladder. Joe called Home Depot, and asked a question. If we buy a ladder, can we use it and return it? And Home Depot said yes. Really? They said yes?! Andrea, Joe, and Eva were looking at the very tall ladders at Home Depot when Andrea’s phone rang. It was the missing maintenance man, who said he had a tall ladder. Off they drove back to the locked apartment without having to buy a tall Home Depot ladder……or return it. Andrea had to try to explain to the probably somewhat skeptical maintenance man that her dogs had locked her out of her apartment. Yes, they really did. He got his tall ladder around to the back of her building, which faces a busy street, and positioned it up against the balcony. He wanted to do the climbing, and Joe wanted to do the climbing, but Andrea said no. She knew that Darcy and Oakley would go crazy up there if they saw a man coming over their balcony. And when he entered the apartment, it wouldn’t be pretty. That’s why many people driving on the busy street……and others inside the lower apartments who were eating supper or watching TV at that moment……must have wondered why they saw a young woman climbing a very tall ladder up to a balcony. Then she carefully climbed from the ladder over her balcony railing, and landed safely on the other side. Thinking of it makes me nervous, but not Andrea. She’s as brave and calm as they come. Darcy and Oakley were beside themselves with excitement when they saw their girl coming up the tall ladder and climbing over the railing to the balcony. They seemed to think that this was the most fun thing that had happened to them in a long time! Andrea thanked Joe and Eva, and she thanked the missing maintenance man who had showed up with the tall ladder, and she tried to fuss at Darcy and Oakley. But they’re just too cute to be mad at for long. Darcy seems to be laughing about the fun they had! They’re probably wondering when their girl is going to climb over the balcony again. She’s got the dead bolt doggie proofed now, she hopes. But I wouldn’t put it past those two. Not at all. Should have gotten her a tall ladder for Christmas. Author hesaidwhatksPosted on February 24, 2015 February 28, 2016 Categories Dogs, Humor, Locked out3 Comments on Unlock the Door! Wanting Aaron to Do Things….Or NOT! We’ve been dealing with an issue concerning Aaron and another client at Paradigm that reminds me of the saying, “What goes around, comes around.” Aaron and this client have a history. When I found out that A. was at Paradigm, in fact, I became very worried…..and for good reason. Briefly, their history is that when Aaron was a new student in a school here, A. was the one assigned to help Aaron adjust. A. was very bossy, and Aaron just doesn’t do bossy. He became very frustrated as the day wore on, and soon he began flicking A. with his finger. His stinging little finger flicks became quite an issue, and so that afternoon I got a call from the school saying that they would have to charge Aaron with assault if he didn’t stop. Wow! So that night Gary and I told Aaron over and over not to touch A. We preached no touching during dinner, during Skip-Bo, during the bedtime routine, and again the following morning until the moment Aaron got on the bus. I worried all day, but I considered the fact that no phone call from the school was a good sign that Aaron had obeyed our repeated directives. That evening, as we ate supper, I finally asked Aaron if he had touched A. It makes for a funny story, even then, but it was such a tangible example to us of just how literal Aaron is. Also, it showed us that we were in for a long school year. We were right about that! And now A. is a client at Paradigm. When I first heard that she was there and I figured out that she was THAT A., I knew we were in for some rough waters. And by the way, if I told Aaron that we were in for rough waters, he would wonder what on earth water has to do with him and A. So, yes, Gary and I have found ourselves in the position of doing damage control over the past year or so that A. joined Paradigm. She and Aaron seemed to pick up right where they left off. Even if they are just teasing each other, the situation often ends up with one of them getting upset. Aaron doesn’t upset easily when it comes to his version of teasing, so I have to say that it’s probably A. who is frustrated most often. Both of them dish it out, but I think Aaron takes it better than A. But Aaron’s teasing can be so annoying, so loud, and so inappropriate, that we can understand A’s frustration. Yet A. often starts the ball rolling, so we are in quite the dilemma. We’ve told Aaron to just not tease…..totally quit teasing, especially teasing A. However, almost everything Aaron does he defines as teasing. If we want Aaron to totally quit teasing, he must either have no human contact or be in a coma. We have tried to redefine the word “teasing”……we have tried to explain true teasing……we have tried to exemplify proper fun teasing…..but nothing really works with Aaron. Autism is so complex. The effects of Aaron’s way of thinking are also very sad. Barb, a manager at Paradigm and a special person in Aaron’s life, told me yesterday how sad it was to watch Aaron trying to fit in. We see it at home all the time, especially when the whole family is together. I wrote about his breakdown at Christmas. Aaron so wants to be a part of a group, but his attempts often result in deep frustration for him because his attempts fall short of what is usually acceptable. We, too, are so embarrassed or upset by his actions that we often have a difficult time stepping back and seeing what the real issues are according to Aaron’s way of processing. For instance, you don’t whack someone hard on the back in order to get their attention or to express your discomfort…..but Aaron does. You don’t pinch a person’s arm, either. Or interrupt other’s conversations by saying, “HEY! !” Or saying, “MOM! !” Over and over. And then talk about aliens or Godzilla or why the Phantom of the Opera wears a mask. At Paradigm, you throw in the fact that many of the other clients also have social challenges and sometimes the atmosphere becomes volatile. Like trying to mix A. and Aaron. A’s mother has expressed some concern to Paradigm. I don’t blame her. That’s why, after Aaron told me last week that he gave A. a resounding whack on her rear, I told Aaron that he should prepare for her parents to be very upset. I told him that one day her parents were going to put their foot down. Period. Yesterday there was a conversation at Paradigm about the A. and Aaron situation, and this intervening individual said that Aaron was not to be around A. anymore. Or something to that effect. The Paradigm staff handled it well, standing up for Aaron, but I knew nothing of all this when Aaron came home. Aaron thought it was A’s mom who had given this ultimatum, but it wasn’t. I talked to Aaron as I prepared supper, telling him that he was seeing the results of his actions…..results we had told him about, especially last week. I was opening some cans as Aaron stood beside me, listening. I hoped he was taking this to heart and learning a lesson. For a few seconds there was a pause in my lecture, and Aaron stood there. Finally he spoke. “So A’s parents put down their foot,” he said. How I wanted to laugh! “Yes, Aaron, they put down their foot,” I replied instead. Aaron stared at me for a few more seconds as the can opener whirred. And I realized once again that if I want to help Aaron, I must come to his level. He had no idea what it meant to “put down their foot.” Silly me! All this time I thought I had made such a good point, but Aaron was just wondering why A’s parents would “put down their foot.” What was that all about? Just as he has no idea, strange as it seems, how to always effectively and appropriately interact with the people in his world. He wants to….he tries…..but he just doesn’t always get it and he isn’t always able to control the impulses that usually control him. Aaron didn’t want to go to Paradigm this morning, which is his way of handling tough and embarrassing situations in his life. However, we know that Aaron can’t be allowed, if at all possible, to retreat from life. So I gently told him that he was going, several times during our morning…..even up to the point that we were in the van at Quik Trip to meet his ride. His driver was filling up with gas, so I tried to get Aaron to just get out and walk over to the Paradigm van there at the pumps. Nope. Aaron wanted to do it the way he always does, waiting for Lisa to pull up beside us. When I mentioned my idea to Aaron, in fact, he had a very insightful comment. “Everyone always wants me to do things!” he replied. Yes, we do. We have good reasons, too, and the best of intentions for Aaron. But he sees our ideas as very annoying, most of the time, and also nearly impossible. I guess rather than “put down my foot,” I should try harder to put away unrealistic expectations and meet Aaron where he is. Be on his side, continue to train, and always see the world through Aaron eyes more than through my own. And to realize how difficult it must be for him to climb in that van and face another day of attempting the sometimes impossible. Just going to Paradigm today was huge for Aaron, much less the thought of facing A. and somehow controlling his impulses for yet another day. Let’s hope he has a good day. An appropriate day. A fun day. And that Aaron isn’t the one “putting down his foot”……on top of A’s foot, knowing Aaron. 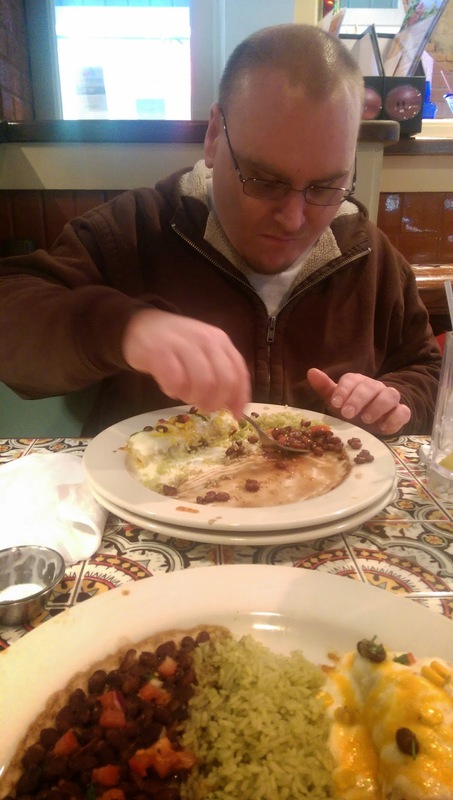 Author hesaidwhatksPosted on February 19, 2015 Categories Adult Autism, Asperger's Syndrome, Consequences, http://schemas.google.com/blogger/2008/kind#postLeave a comment on Wanting Aaron to Do Things….Or NOT! The Meat Goes ON the Rice! I stood in front of the greeting card display a couple weeks ago, locating the various categories of Valentine cards that pertained to me. Husband….sons…..daughter…..friends…..special ones. I paused at the “mother” category, and then skipped over it as I continued my search for just the right card for each person on my list. Sometimes it takes forever to find just the right sentiment, and today was one of those days. I decided on several cards, but there were still some unchecked names on my list. “Well, I would just have to go to another store and see what choices they offered,” I thought as I went on my way. 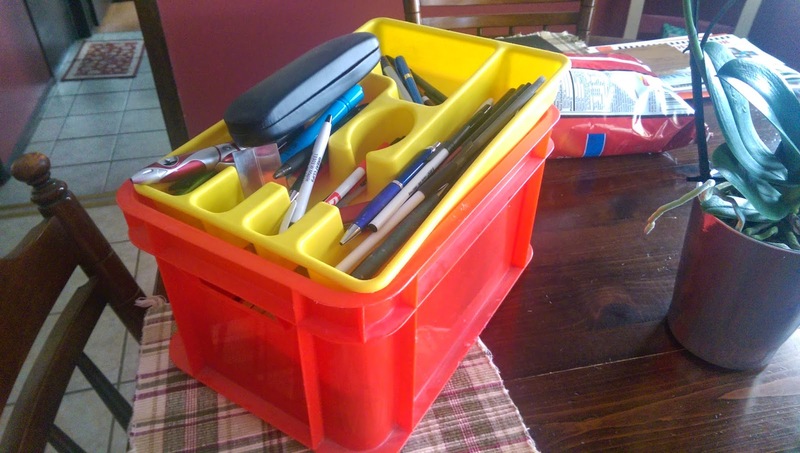 I later made a new list in my “brain notebook” that sits in my cool ThirtyOne notebook holder. It’s the notepad that’s just like the one Mom used…..the one she called her “brain”……..with all of her lists and her scribbled notes. Just like Mom. Like my mother used to be. And there she was, once again, in my life and in my memories……although she is still living, but not like we all knew her. My new list consisted of items that I hadn’t been able to find on this day of shopping, and among them were three Valentine cards yet to be chosen. As I looked at those names, I knew that one was missing, and I felt guilty. My mother was not on that list. I had overlooked that section earlier that day, on purpose. Why get a card for my mother? She is now deeply affected by Alzheimer’s. She doesn’t know any of us. She doesn’t even know that she has children at all. Not only that hard fact, but my mother doesn’t know what Valentine’s Day is all about. It wouldn’t affect her one bit to not receive a card, and it wouldn’t affect her one bit TO receive a card. And further, my mother doesn’t even know what a card is or what it is for. It’s all tragic and sad and completely impossible to believe that this is true of my mom. My mother was beautiful, and she was gifted in so many ways. 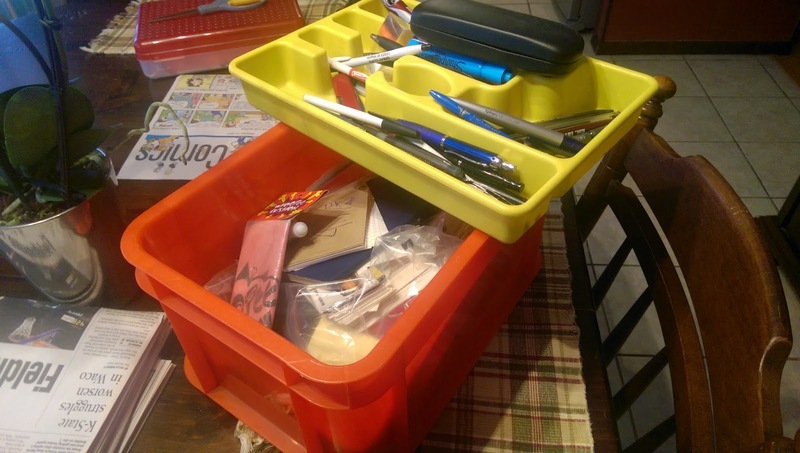 She was an extremely hard worker, and organized to the max. She even washed her dishes a certain way, and taught her four daughters to do the same. I thought of this fact one night last November when our dishwasher sat broken and useless in its place in our kitchen. I filled the kitchen sink with hot, soapy water and began to place the dishes down in the suds. I smiled as I thought of how Mom taught us to wash the dishes in a certain order and even to put them in a particular place in the sink. Obsessive? Maybe. 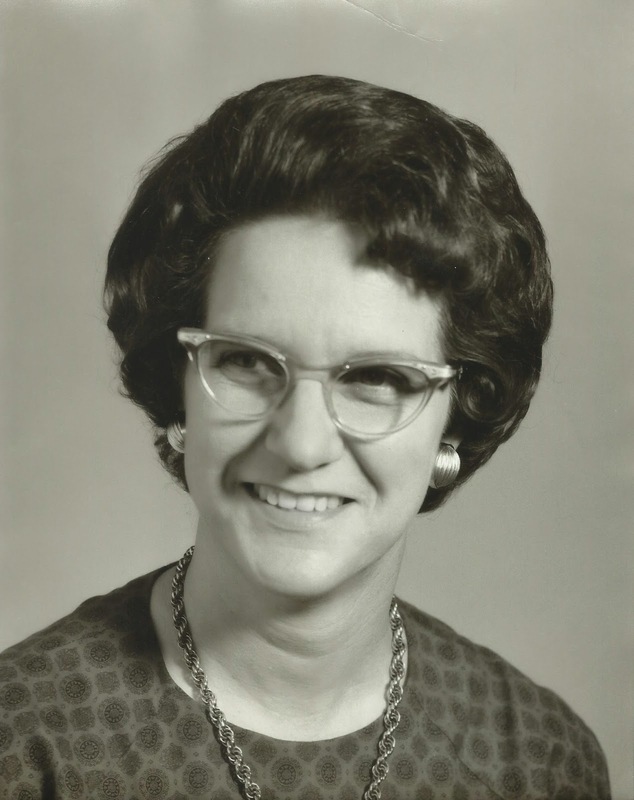 But it makes sense, the way she taught us, and I thought as I washed my dishes that night…..in my mother’s order……that I bet each of my sisters would load their dirty dishes into their sinks exactly the way that I was placing mine that night. 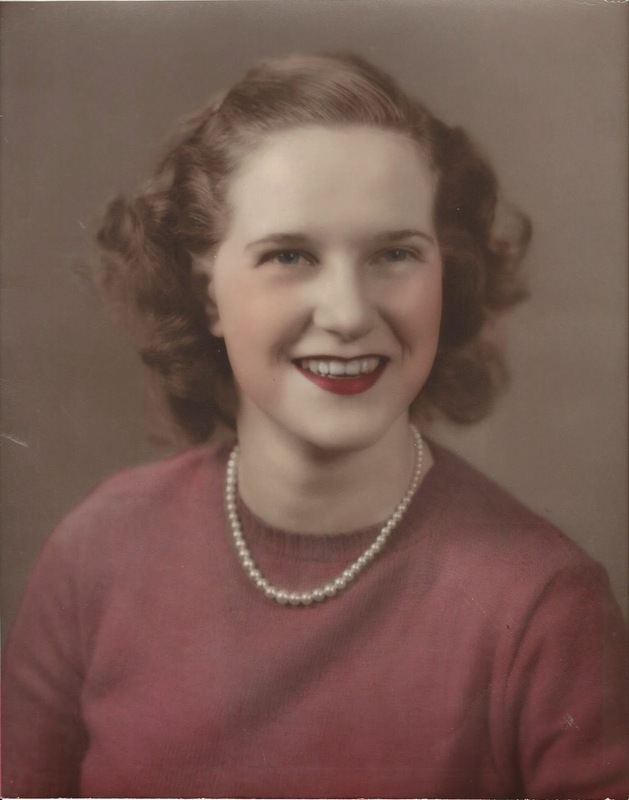 My mother’s teaching and her influence go far beyond how to load the kitchen sink, certainly, but it’s in those practical ways that I find myself often drawn to her. One of our favorite stories about Mom that make my family laugh is the one about the time that Mom and Dad had all of us over for dinner when we were visiting. Mom had cooked beef in gravy with rice on the side. She set the line up as a buffet, and she watched carefully as either Bethany or Martha….don’t remember which……put their rice on the plate and then put the meat on their plate separately from the rice. Mom pulled herself up to all of her maybe 5’2” frame and announced loudly, “The meat goes ON the rice!” We all wanted to burst out laughing, and we did roll our eyes when she wasn’t watching……but we all loved her for it. That was Mom. “The meat goes ON the rice!” is now one of our favorite sayings. Now Mom doesn’t even know what rice is…..or meat…..and often doesn’t know what to do with the meat and the rice that might be on her plate. Jan sent us a video last night of a recent visit with Mom. She wasn’t sure that we would want to see it, but we told her yes……please send it and let us see our little mother. It was heart wrenching and sad to see her so completely unaware of anything and anybody. To see her showing fear, shaking and scared. Our mother is gone. The woman who bore us and raised us, and instilled in us so many amazing values that were her own, is now gone. But her body is here, and she is loved by all of us……and excellently cared for by Bob and Jan, and John and Jeanie. It’s all we can do…..love her and care for her and definitely to pray for her. And for me personally, to buy her that card. Yes, I added her name to my list and I went to the “Mother” section of the Valentine cards. I found just the right card, surprisingly enough…..one that talked about what my mother had done, not what she was doing now. And what she HAS done is plenty! All of her children and grandchildren are reaping the benefits and blessings of all that my mother HAS done in her life well lived. I really know that I sent her that card, not for her, but for me. 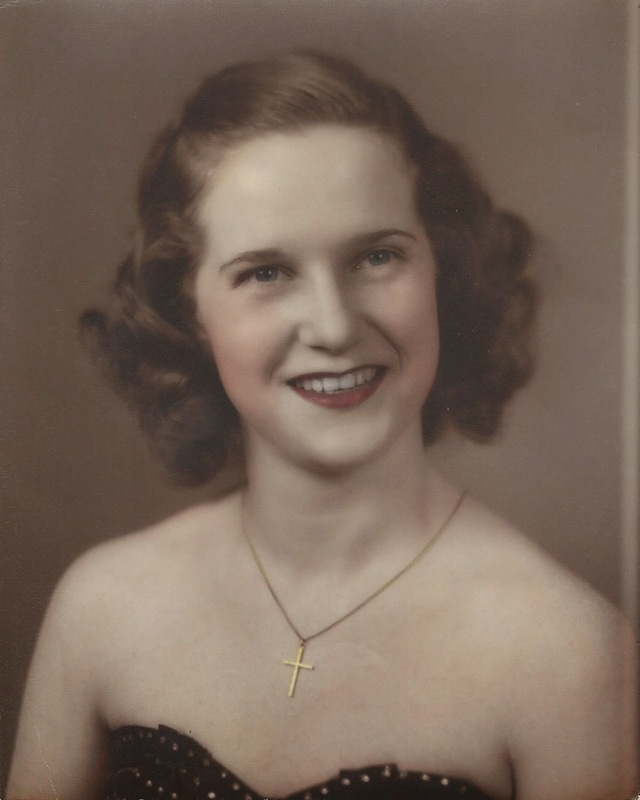 I needed to remind myself of all that my wonderful little mother was, and of all that she is still doing in my life today. In that way, I honor her, though she is unaware of that. Remember now: The drinking glasses are washed first, then the plates and the silverware…..with the silverware in front and the plates behind them…. And the meat goes ON the rice, for crying out loud! Author hesaidwhatksPosted on February 16, 2015 February 28, 2016 Categories Alzheimer's, Family, http://schemas.google.com/blogger/2008/kind#post, Mom, Valentine's DayLeave a comment on The Meat Goes ON the Rice! 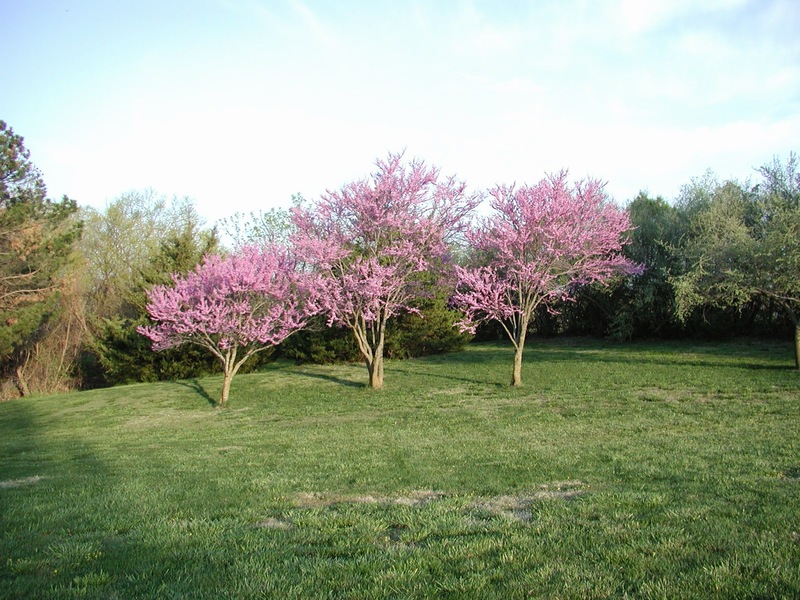 We have three Redbud trees out in our back yard, standing alone in a little row. Every spring they bloom beautifully and give us a lot of joy as we look at them from the house. However, we began to notice over the past couple years that they were struggling. They just weren’t as vibrant and full, especially the tree in the middle. Finally, last year, we had to cut down that middle tree. We felt it was just too far gone to have any hope of survival. Weeks went by, and one day as I stood at our kitchen window, I noticed something between the two remaining Redbuds. It looked like a clump of some sort. Was it a pile of dead grass left from Gary’s mowing? I soon forgot about it, but once again several days later I noticed it in the distance. This time my curiosity got the best of me, so I walked down to the two trees to investigate. I was a little surprised to see some small twigs poking out of the ground, complete with little leaves on them. 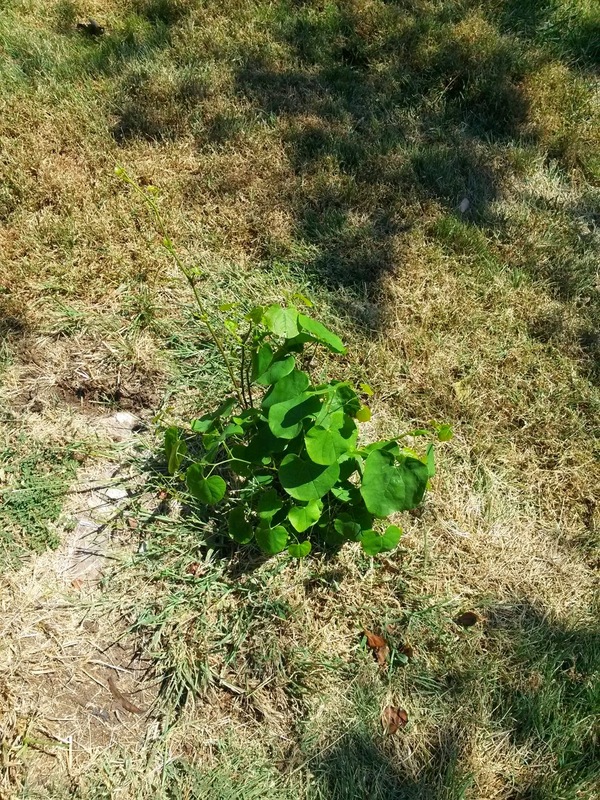 Could it be the Redbud still growing? Of course, I shouldn’t have been so surprised. The following few weeks proved my guess to be true. 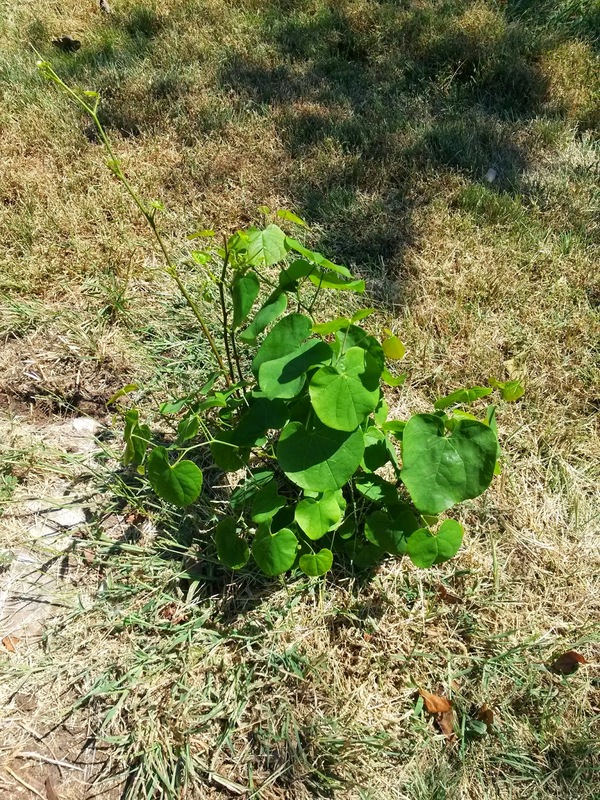 The chopped down Redbud was indeed growing again, and why shouldn’t it? The Redbud roots were still in the ground, undamaged and alive. Those roots were doing what Redbud roots do. They were growing a new little tree, or at least the beginnings of a new tree. So there between the two tall Redbuds stood this living, growing small tree. It wasn’t showy…..it wasn’t big…..it was hardly noticeable…..but it was growing faithfully. A couple weeks ago I was reading Daniel 6, the story of Daniel in the lion’s den. Yet what captured my attention this time, more than the den of lions, was what brought Daniel to this point in his life. Daniel had shown maturity and faithfulness over the years as he was held captive in Babylon. There he was, along with his friends……young Jewish men in the middle of their enemies. They continually obeyed God while living in very difficult circumstances, all the while being mature and respectful. God blessed them for their faithfulness. He gave them protection and He gave them responsible jobs within the Babylonian government. Darius decided to appoint 120 assistants that would be in charge of his kingdom. He appointed three commissioners to be in charge of the 120 assistants. Daniel was one of those three commissioners. As time went on, Daniel distinguished himself so much among the other commissioners and the assistants that Darius planned to appoint him over the entire kingdom. This made the other commissioners and the assistants very angry. They were jealous of Daniel, and so they decided to plot against Daniel……to find some corruption in him concerning his government job, and then to use that as grounds for expulsion. However, they could find no grounds of accusation, so they went to Plan B. Plan B was to devise a plot of some sort concerning Daniel’s religion that would at last give them grounds to be rid of Daniel. They approached Darius with praise as they stroked his ego, telling him how almighty he was. In fact, they managed to talk Darius into believing that he was so majestic that he should build an image of himself, and then enforce a law that everyone must bow to his image and pray to him for thirty days. If anyone prayed to any other god during this thirty day period, then they would be cast into the den of lions. Darius, full of himself, signed this law…..a law of the Medes and Persians that could not be revoked. In other words, Daniel just kept being faithful. He continued to obey God. He continued to grow. He knelt as he always did, in front of his open window for all to see, including the hateful plotters. And his conniving fellow workers came by agreement, we’re told – and just as they planned, they found Daniel praying before his God. I’m sure they were beside themselves with satisfaction as they presented their evidence to Darius……evidence that Darius’ favorite was a law-breaker……along with the reminder of the new law, the one that couldn’t be revoked. Darius was in a pickle, and soon Daniel was in the lion’s den. You and I live in some pretty stressful times…..times that are particularly stressful for followers of Christ. Our culture and our politics are full of craziness right now. I’ve never talked to so many who are feeling burdened and even very worried about the future. God’s Word is being rewritten by those who want it to say whatever would support their lifestyle. Legislation is being enacted in order to legally defend their beliefs. Christians are mocked, hated, ridiculed, and even arrested. And though these times were prophesied and we have known that someday they would come, many of us find ourselves awake at night, wondering how bad it’s going to get. So I think of our little Redbud and I see a lesson. I see faithfulness to grow….to grow from the roots that are deeply planted. 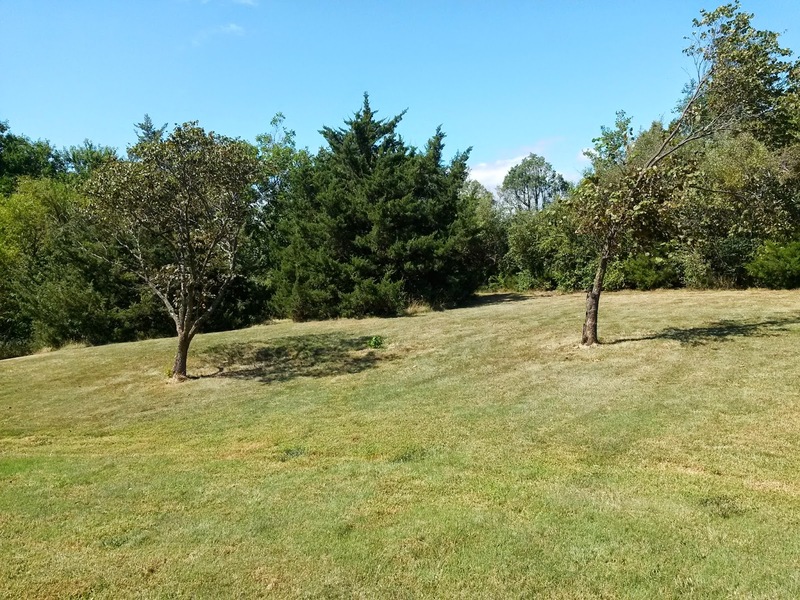 Just to grow, surrounded by trees much larger than it is. To grow like Daniel, faithfully serving God in the midst of extremely difficult circumstances. Daniel knew what he faced. Lions…..very hungry lions! Yet he just quietly and constantly obeyed God by praying as he always prayed, and trusting God to take care of him. So I want to say to all of us who are walking the narrow way, following God in this world where to be narrow is considered an insult, to just be faithful in the ways that you have always been faithful. Be like Daniel. CONTINUE to obey God, and CONSTANTLY serve Him, even if there might be some lions in our future. Don’t bow to the pressure of this culture and to the pressure of large issues that we face. Instead, let’s bow our knees to the one and only God in Whom we need to be deeply rooted. The same God Daniel served is here for you and for me today. And we do know the end of the story, don’t we? The first one was at 11:46. The second at 1:33, and the third at 2:48. Aaron’s seizures last night…..and how I hate them! I was able to give him some Ativan when I heard him stirring about an hour after the first seizure. I think the Ativan helped the next two seizures not to be as severe as they usually are. I lay in bed during those hours, comfortable but unable to sleep as I listened to Aaron through the baby monitor. I used some of that time to pray, and to ask God to ward off my fearful thoughts about Aaron and about our world. I prayed for family and for friends as well. I don’t remember exactly when Aaron got up from bed this morning, but I am sure that he knows. I am also sure that he wrote it in his special notebook that holds those important times that he faithfully records, every single day. He looked more than a little worse for wear as he came into the kitchen, staring at me sitting at the table. He told me that he didn’t feel well and I told him that he had some seizures, which he never remembers….thankfully. He took his pills, and I gave him something for his headache as well. Seizures cause such awful headaches. Some things work out like that for Aaron, and some things just don’t. We can’t pick and choose on what day his seizures will occur, of course. It’s just extra sad when he has to miss something special because he’s too sick to go, again. I was tempted to just stay home all day with him, but as the morning went on he seemed to be feeling pretty good. He came into my room and I asked him how his head was feeling. “It’s becoming fine,” he answered. I just love the way Aaron phrases responses like that. It’s uniquely Aaron, and it makes me stop and smile. He smiled when I asked him if he wanted to go to McDonalds for lunch, and use his gift card that Aunt Sandra gave him for Christmas. I even got brave and decided that we would eat inside the restaurant, hoping that he didn’t have a seizure there. He didn’t. He was mostly slow and quiet, which is typical on the day following a night of seizures. He lacks his usual zip. He’s rather flat. But he did notice the little girl sitting in the booth nearby with her grandmother, and when she noticed him, they waved and Aaron smiled. It made me thankful that I had decided to go inside to sit. 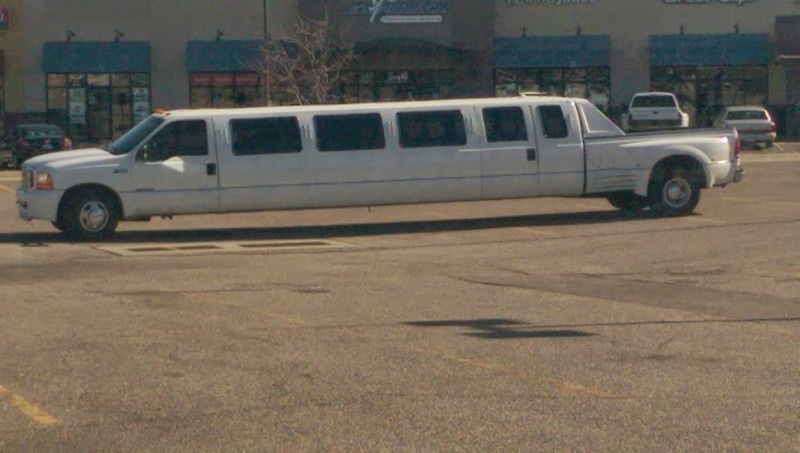 We went to our vet for dog food, and there in the Dillon’s parking lot we saw this huge truck/limo that made us both laugh, and become very curious. Aaron wanted me to drive behind the truck/limo so that he could try to decode what the personal license plate said. 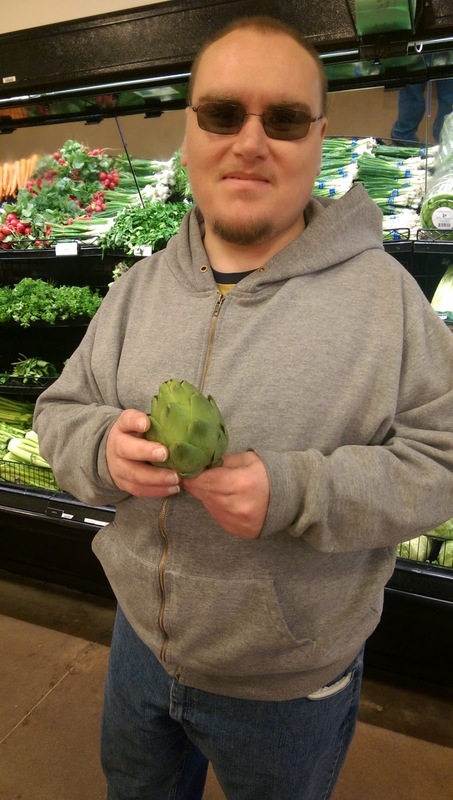 And inside Dillon’s, as I chose a head of lettuce, Aaron found his favorite……artichokes! He stopped to look at the Chinese food in the deli as he always does, and as always I had to tell the server that we weren’t buying…..only looking. Of course, we had to stop to look at the lobsters, shrimp, and crab legs on ice in the seafood department. It’s best not to be in a hurry if I go to Dillon’s with Aaron. But it pleased me to see him being happy over such mundane things that we take for granted…..especially on this day after his nighttime seizures. Giving him a little fun doesn’t cost me much at all, but it sure brings priceless joy to my heart, and to his as well. Just two evenings ago I was telling Andrea on the phone about Aaron’s seizure that morning. It always makes the kids sad to hear about his seizures. I told Andrea, though, that it was such a blessing that Aaron doesn’t seem sad over his seizures, really. He doesn’t talk about all the things he can’t do or how hard it is to be different. He doesn’t seem to grieve the loss in his life that makes the rest of us sad for him. But don’t you know, that very evening, Aaron said, “Mom, I wish scientists could stop my seizures so that I could be normal.” This comment stopped me in my tracks, and left me struggling for words as Aaron repeated it again in case I hadn’t heard him. I assured him that I understood, and that I wished scientists could stop his seizures, too. I walked upstairs with my load of clean towels, swallowing the lump that was suddenly in my throat. So Aaron does sometimes think thoughts that he doesn’t often share. He does wish that he could be “normal.” I was thankful that he expressed himself in a way that he usually doesn’t…..in a way that he finds hard to do. But his simple comment made my strong outward reserve crack some, and I had to walk away quickly lest he see my tears. This pose was so out-of-character for Aaron that I just laughed and laughed, which delighted Aaron. He didn’t even mind that I took his picture. There he was, Aaron posing as this certain super hero. 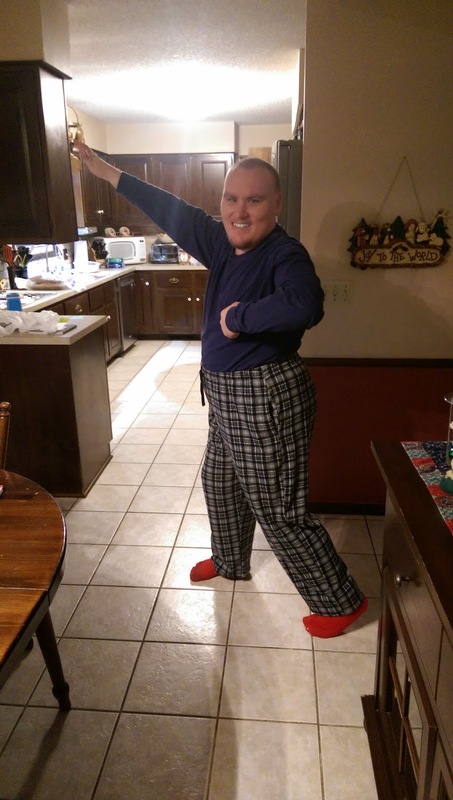 In reality, though, as I’ve pondered that funny pose, I realize that Aaron truly is a hero. At least in my book he’s a hero. He’s a hero for enduring so much pain and so much hurt and so much disappointment over the years……so much physical and emotional hardship. Yet he continues to go through each day in his Aaron way, hardly ever complaining. He pushes through each day despite his seizures and his social difficulties. He sure is an example to me when I feel overwhelmed or tired or discouraged. I know many parents of special children who would agree with me on this when it comes to their kids, no matter their age. I hear their stories often. Children with seizures, Downs, autism, and so many other issues. Children who just pick themselves up and keep on truckin’. And parents who love them with all their hearts. They are heroes as well, and they are all around us. So today, and every day, I know that we live with our special SUPER hero. He teaches me not to give up, on him or anything else in life. We’ll keep plugging along beside Aaron, trying to care for him and provide for him. Trying to understand him and to instruct him, especially when his mouth or his hands get out of line. Trying to explain him when necessary, and to defend him if needed. And trying to help him believe that he IS normal and wonderful and special……just like a SUPER hero should be.